In this book, author and teacher Katy Ridnouer focuses on the potentially overwhelming, sometimes puzzling, often delicate work of engaging both students and parents in the pursuit of learning and achievement. Connect with students and parents as individuals. Communicate invitations to engagement (and regroup and respond if your initial invitations are rejected). Provide appropriate, ongoing support and encouragement that will keep students in class, behavior in check, and learning on track. Anticipate and handle setbacks and complications in teacher-student and teacher-parent relationships. Tap outside resources to extend learning beyond the walls of the classroom. Ridnouer believes that every teacher has the power to make students and parents partners in learning. 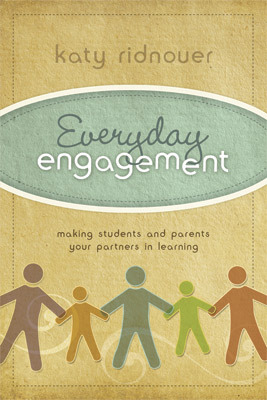 When a teacher embeds pro-engagement action and attitudes into everyday practice, the question is not if students and parents will be engaged in classroom learning, but how they will choose to engage and how far that engagement will take them. —Jim Hattabaugh, education consultant, Fort Smith, Ark. published by the American Association of School Administrators. for the Kean University National Writing Project, Union, N.J.
KATY RIDNOUER teaches with the intention of giving students the tools they need to articulate their unique voices. She does this by creating strategies that help students lift the veils that block efficient learning so that they may use their strengths, cope with their weaknesses, and become successful learners. She has taught in a variety of settings, including public middle and high schools; a private school for students with learning difficulties; a GED program for adult women on the Cheyenne River Reservation in S.Dak. ; a tutoring center specializing in treating students with learning difficulties; a private school in Dublin, Ireland; and at Central Piedmont Community College, her current position.